Hi again friends! 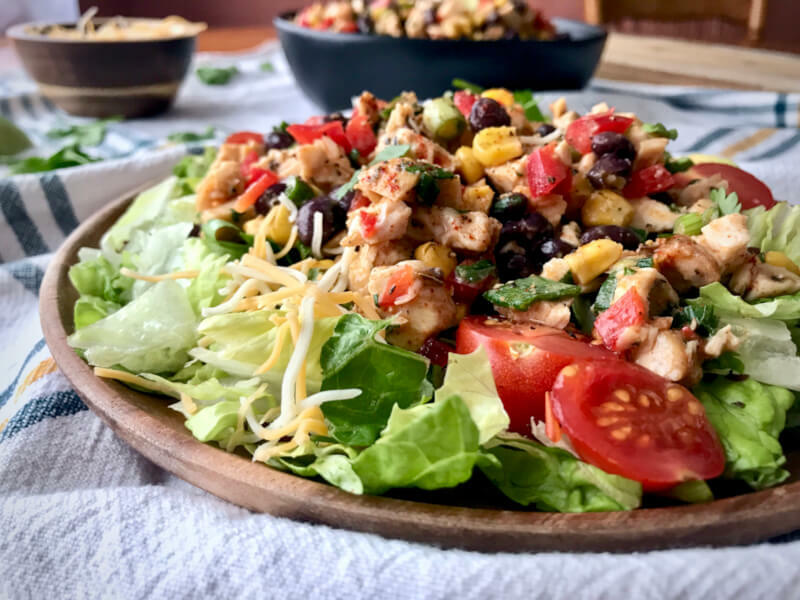 Right on the heels of yesterday’s Easy Baked Chicken Breast, I’m serving up this delicious Southwest Chicken Salad! 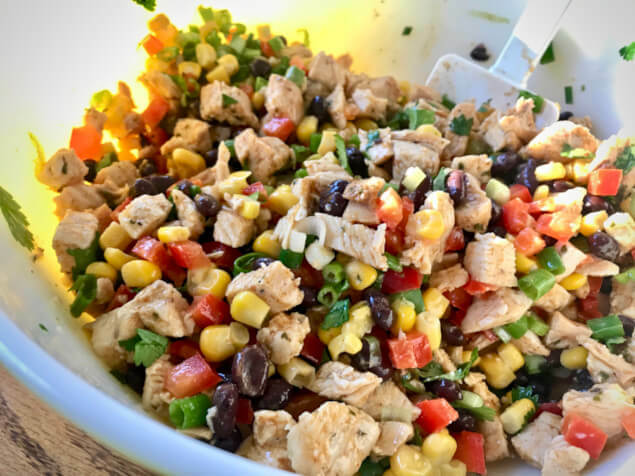 It’s a delectable mix of diced chicken, black beans, corn, red peppers, and cilantro, that’s been tossed with a creamy dressing! 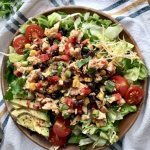 Southwest Chicken Salad is great for meal prepped lunches. I love it on a big bed of chopped lettuce, or in a hearty wrap. Hi there friends, I know it’s been awhile since I’ve posted anything new. It’s been a heck of a year so far, but I’m ready to get back to it! 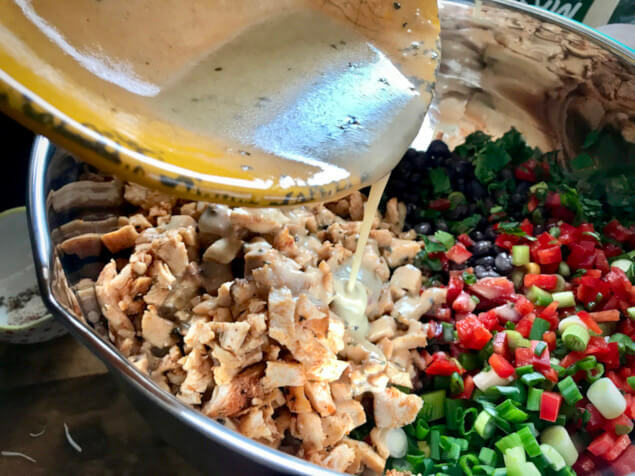 And on that note, I’m so very excited to share this Southwest Chicken Salad recipe! How many of you think of ‘Chicken Salad’ as creamy stuff in a bowl with celery, grapes, maybe some nuts, and not a whole lot of taste? 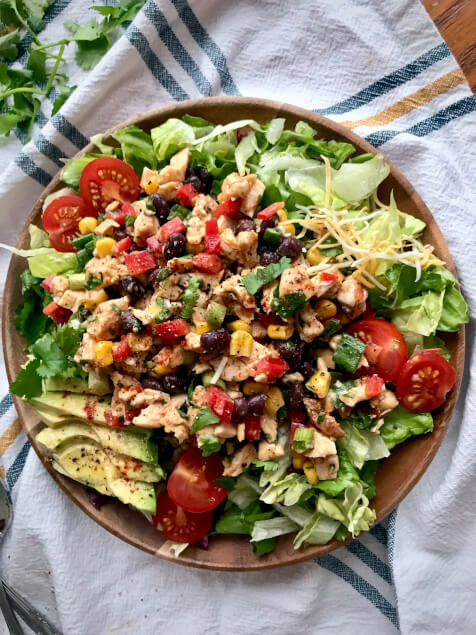 Welp, I’m here to blow your minds… because this Southwest Chicken Salad is not your average recipe, and you’re going to wanna make it right now! It’s just the thing to stir into a big salad, or it’s absolutely perfect for stuffing in a wrap with some avocado, cheese, and lettuce. Or, if you’re not feelin’ fancy (and lord knows we all have those days), just grab this Chicken Salad and a bag of crunchy nachos, and start scoopin’! There’s a story behind the invention of this recipe, and it’s not a very happy one, but I’m going to go ahead and share it with y’all. During the first few days of this new year, in a very sad and unfortunate turn of events, my Gramma unexpectedly passed away. So my mom, sister, my nephew and I took off straight away, and made the long drive up to be with family in Minnesota. Eric and Pepper made the trip soon after. Of course, it was a very tough week for us all, but I felt extra lost without my sweet little girl and Eric, even for that brief time. I was standing in my Auntie Brenda’s beautiful kitchen, wishing for the strength to help me through. There’s nothing quite like the turbulent emotional storm we all experience after a loved one goes away. Those warm, welcome waves of all the good times wash over us- unforgettable memories of laughs, hugs, and sweet smiles. But just as quickly, we’re dragged back down by the deep, cold waves of reality and finality, loss and regret… the heart longs for those feelings and memories, even while deep down, we know we’ll never experience them again. It was during this very sad and tough time that I created this Southwest Chicken Salad. And while there’s no doubt that this recipe came out of a time of sadness, it truly gave me great comfort to create and cook food for the family, and to watch all of them enjoy it. In fact, they raved about it! They loved it so much, I was only able to photograph the first part of the recipe- they crowded into the kitchen and ate it all up so quickly, I had to take all the final photos later on when I returned home. Haa! I guess a good meal with good people can bring a lil’ sunshine into any situation. My mom and aunt decided to ditch the salad and/or wrap part, and simply scoop it up with chips! 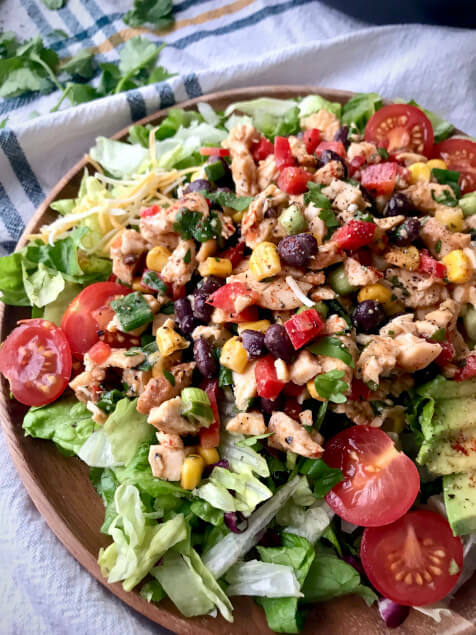 So for real, this Southwest Chicken Salad is so versatile. You can make it once, and then throughout the week eat it 5 different times, and in 5 different ways! You’ve gotta love that. Now let’s get in the kitchen. In a big ol’ bowl, throw in some diced chicken (preferably some of my Easy Baked Chicken Breast), a can’a black beans, one medium diced red pepper, about a cup of chopped green onions, one cup of frozen corn that’s been thawed a bit, and about 1/4 cup of chopped cilantro. 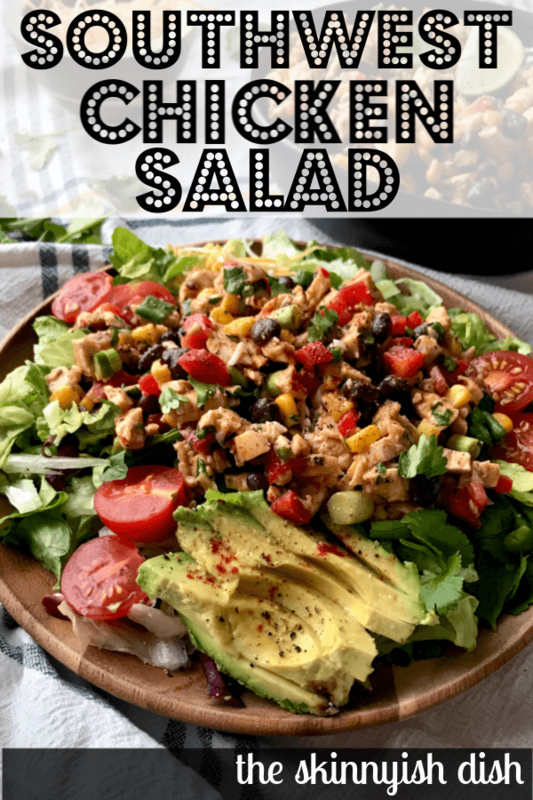 For this dressing (WARNING: It’s so delish, you’ll want to just pour it in a cup, grab a straw and drink… don’t do that though, the chicken will be lonely. 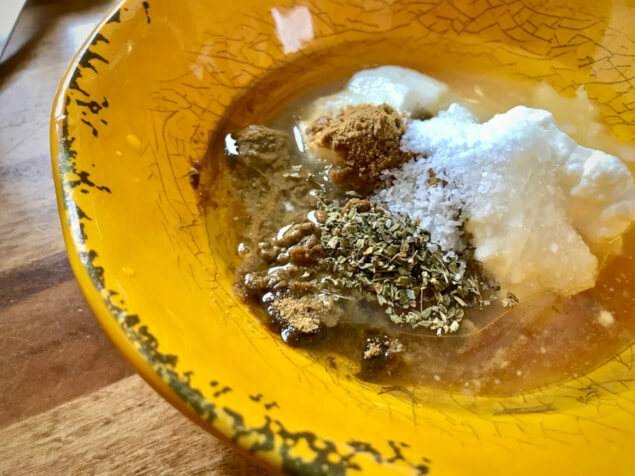 ), you’ll need to grab’a a small bowl and add the juice of one lime (about 3 tbsp), the juice of half of a lemon (about 2 tbsp), 2 tablespoons of honeeeeyy, 3 tablespoons of olive oil, 1/4 cup’a nonfat Greek yogurt, 2 teaspoons of cumin, 1/2 teaspoon of oregano, and 1 teaspoon of kosher salt. Whisk together well. Pour the dressing into the bowl over the chicken mixture, and stir it up really well. Salt and Pepper to taste. *Sighhh* This is such a magical mixture! For best results: Before serving/Eating, cover it up and throw it in the fridge for about 20 minutes, to let all those flavors mingle and get to know each other much better. My favorite way to gobble this up in salad form is to just plop it on top of some chopped up romaine lettuce that’s been tossed with just a smidge of salt & pep. I add a few cherry tomatoes, a pinch or two of cheese, and some gorgeous lil’ avocado chunks, and I am in Southwest Chicken Salad heaven. It’s also super delish stuffed and rolled up into a wrap. And, like I said before- my mama and aunt decided it was best scooped up with tortilla chips. I just know it’d be great scooped up with some mini red pepper slices too! This chicken salad alone is full of so much flavor. It’s great for meal prepping on Sunday, and then just pack it up for lunches throughout the week! I hope you love it as much as my whole family does. Be sure to comment below and let me know if you’ve tried it! 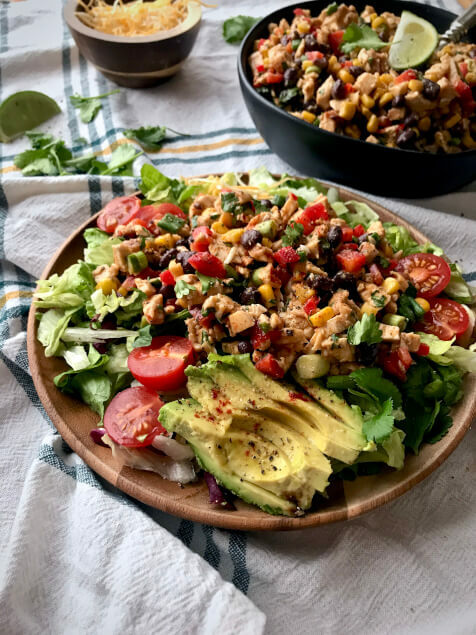 Southwest Chicken Salad is filled with diced chicken, black beans, corn, red peppers, cilantro, and lots of flavor! This chicken salad makes for an ideal salad mix-in, or stuffed into a wrap. It’s perfect to meal prep with this, and have it on hand for easy, delicious, and widely varied lunches all week! 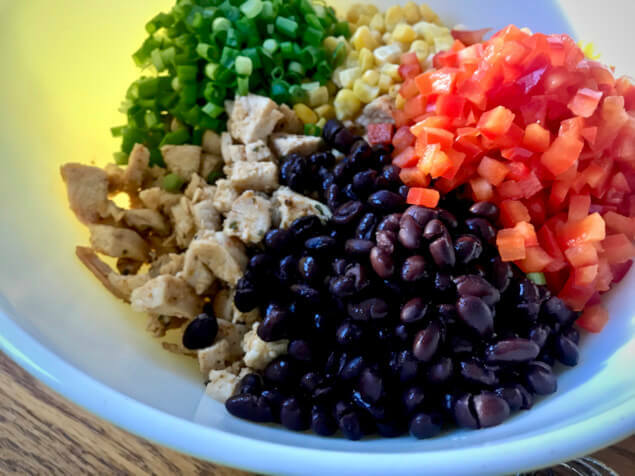 In a large bowl add the diced chicken, black beans, corn, red pepper, cilantro, and green onions together. Stir well. 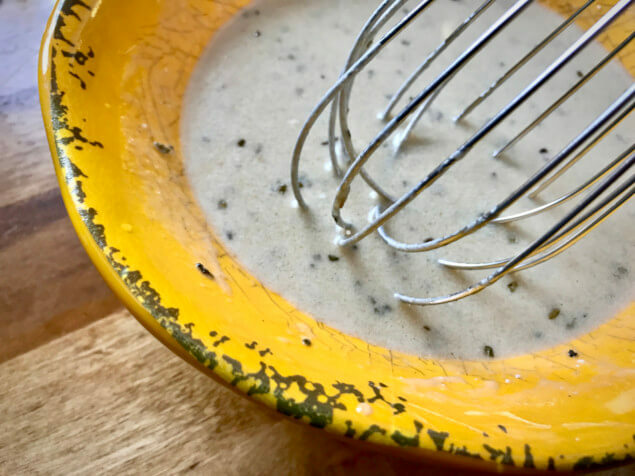 To make the creamy dressing: In a small bowl add juice of half of a lemon and one lime, olive oil, greek yogurt, honey, cumin, oregano, and salt. Add the creamy dressing to the chicken mixture and stir together well. Salt and Pepper to personal preference and then cover it tightly and place in the fridge for at least twenty minutes to let the flavors mingle. Makes 8 cups. Serving size: 1 cup. Haha! Those darn husbands. I’m so happy y’all love it! Thanks for letting me know! So this was my first recipe of yours to try and I followed it to the letter. It was so good I ate it every day for a week and then made it again! My husband loves it. My brother loved it. Everyone who had it loved it. It retains a fresh taste for days and the flavors just get better and better. Thank you for sharing this amazing recipe with the points! Now I am moving on to your Skillet Chipotle Chicken. Thanks again! I’m so happy you loved it so much, Sherry! thank you for stopping back by to let me know! =) I hope you love the chipotle chicken too! This was so good!!! However did the calculations on the WW app and it came up 5 SmartPoints instead of 3. Hey there, If you just entered the nutritional info into the app then it will come up as more because all of the nutritional information contains the zero points ww foods like chicken, beans, and corn so it will come up higher, however I build the recipes into the WW app in their recipe builder. This is amazing!!!! I have made it a few times, and it is now a kitchen staple! I love all your recipes so much!! I was thinking of using this dressing for other salads, would you know the points value on the dressing alone? Star – I can’t thank you enough for this recipe. It’s delicious! It’s totally worth the prep time, and I cannot wait to eat this throughout the week. I used a rotisserie chicken to save a little time, and it was yummy! Hey Cheryl! I am soooooo happy you love it!! This salad is yummy! Before adding the last 3 ingredients and the dressing I divided it in half. One half I used for my husband,who is not a salad eater, added brown rice and heated it in the microwave. He loved it. The other half I used for me, tossing it with 6 tablespoons of dressing and I’m eating it on top of chopped kale. In the picture I noticed lettuce, tomatoes and looks like cheese but these are not mentioned in the recipe. So would that add more points if you add that to the salad? Thank you! I’m going to try it because it does look delicious! This is my new favorite salad! I love your recipes!! I’m so happy you love it, Kathy! Thanks for letting me know! I haven’t technically eaten it completely warm, but I have stuffed it into a flatbread wrap and then grilled the wrap with cheese in it so it was kind of warmed and tasted delicious! How many tablespoons of dressing can I get for the 3 points? I plan to meal prep this individually throughout the week. Ps. thank you for always sharing your yummy recipes!! Hi Amy, I’m sorry, but I haven’t figured out how much the dressing makes so I don’t have that info. You can actually just toss it all together with the chicken and all. It keeps well in the fridge! I just finished making the Southwest Chicken Salad, and it is in my refrigerator as we speak. I can not wait to try it! Thank you for all your delicious recipes!